The Donaldsonville Historic District is located on the west bank of the Mississippi River and encompasses an area of about 50 blocks. The buildings, about 640 of them, date mainly from the period of 1865-1933 and include residences, commercial, and public buildings, five churches, and three cemeteries, of the Roman Catholic, Protestant, and Jewish faiths. The Donaldsonville Historic District is architecturally significant because it contains the finest collection of buildings from the pre-Civil War era to 1933 to be found in any of the Mississippi River parishes above New Orleans. 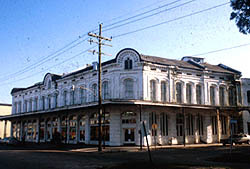 Comparable to other Mississippi River towns in Louisiana, Donaldsonville contains a number of Queen Anne Revival residences and a number of Italiante commercial buildings. Donaldsonville is unique in that it retains a sizable complement of working class areas complete with housing including shotgun houses, cottages and bungalows, as well as neighborhood stores. Donaldsonville also possesses several neo-classical buildings and two fine Romanesque Revival office buildings. 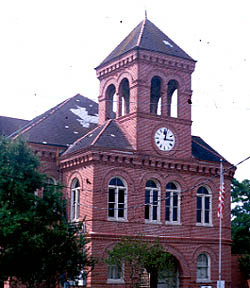 A Romanesque Revival Courthouse, the site of which was part of the 1807 plan for Donaldsonville, is located on Houmas Street. Moreover, the Lemann Store, located at 314 Mississippi Street, is probably the finest Italiante commercial building in any Mississippi River town north of New Orleans. With its cast-iron gallery, its three-story sprawling mass, and its rich ornamentation, the Lemnan Store, built in 1878, stands as a monument to architect James Freret, the first New Orleans architect to study at the Ecole des Beaux-Arts in Paris. The development of Donaldsonville began in 1806 when William Donaldson hired Bartholemew Lafon to prepare a street plan. It included a number of grand public spaces: a semicircular park and drive along the Mississippi River (Crescent Park and Drive) and Louisiana Square, all of which are still extant. After the majority of the town was destroyed during the Civil War, the town's recovery came in the form of the New Orleans, Mobile and Chattanooga Railroad, which began regular service between Donaldsonville and New Orleans in 1871. Donaldsonville is one of only three Mississippi River towns in the state north of New Orleans, which go beyond the normal speculative grid plan. Donaldsonville's plan incorporates baroque features such as a semicircular park and an axial street leading to an open public square. The Donaldsonville Historic District is bounded roughly by the waterway of Bayou LaFourche on the west, the Mississippi River levee to the northeast, Church St. on the east and by Marchand Dr. on the south, in Donaldsonville. From I-10, take exit 182 to the Sunshine Bridge and take Hwy. 3120 north to Donaldsonville. Residences are private and not open to the public, but many of the businesses, institutions, and government buildings welcome visitors. Visit the Donaldsonville Tourist Information Center at 714 Railroad Ave., open 8:30am to 5pm daily or call 225-473-4814 for further information.